Oh, I almost forgot. Here is my vague nod towards Easter chocolatiness. 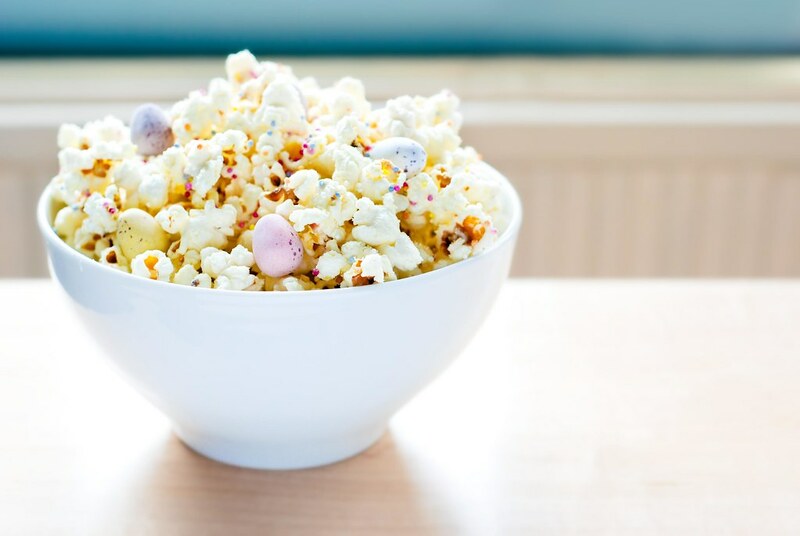 Fresh popcorn, drizzled with melted white chocolate, sprinkled with ‘hundreds and thousands’, a pinch of salt and Cadbury’s mini eggs. Good for Easter weekend movie viewing. I think I will make this. I have a bunch of kids coming over today. They will love it. I cooked a big pan of popcorn and melted 2 packs of white choc chips and stirred it together in a deep baking tray. it needs a bit of salt to counteract the sweetness…and plenty of shprinkles! What a lovely idea. I’ve eaten so much chocolate today I might have to give it a rest for a while, but will definitely be making this soon! I love love (love) Cadbury mini eggs, so this sounds awesome. Happy Easter, guys! Cool should have done this with my mini eggs!